Experience the Baja 5B like never beforeâ€”fully loaded and wrapped in a hard-core Kraken Roll cage, just like the full scale racers.Fit a fully built and painted Baja 5B with a Kraken RC roll cage and you get one of the coolest, meanest RC vehicles around. 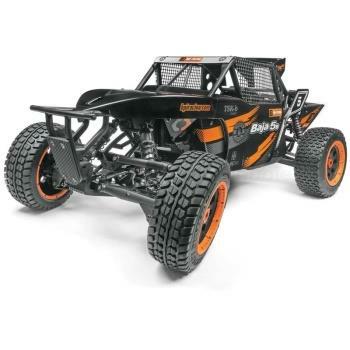 A classic sand rail and a TSK-b Class 1 are both available with a fully functional polymer roll cage and polycarbonate body panels from Kraken RC.Either vehicle delivers the pounding power of the Baja 5Bâ€”equipped with a driven HPI Fuelie K26 engine and ready to take on the sands. They’re also armed with the latest heavy duty suspension and drivetrain components for maximum off-roading.